Aching: in my arms and legs. I removed 74 dandelions from the front lawn yesterday (down from the year before) and woof I feel it. We raked up the dead crap and planted more seeds. If the lawn doesn’t take THIS year, NEXT year I’m putting in a ball pit. Reading: I went to the library today to drop off and check out some more books. I picked up The Violet Hour, American Fire: Love, Arson, and Life in a Vanishing Land, The Sunshine Sisters, and a book of poetry by Mary Oliver. I’m not a poem person, but it is National Poetry Month so why not? Psyching: myself up to get back to work tomorrow after a stint in Austin. Luckily, I’m working from home tomorrow so the transition won’t be so bad. 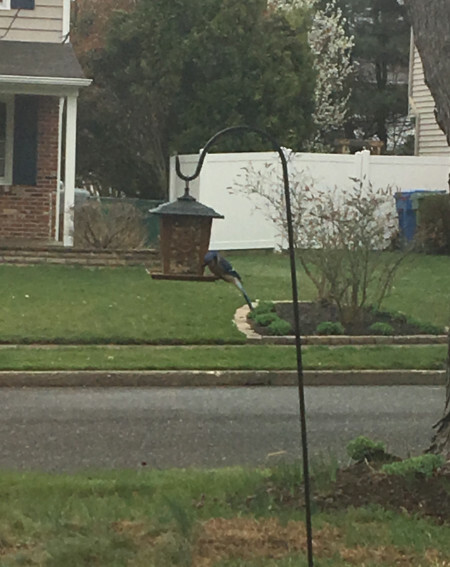 Love the new feeder, Kim! Have you ever heard of Birds Be Safe cat collars? They’re actually these bibs that go over the cat’s chest (attached to the collar) and we used them with our female cat for a couple of years. She was SO bad about catching anything that moved. Anyway, thought it might help keep your birds safe! I would have taken those out for you. I eat the plants, but then, if it was the front yard…. mmmm maybe not. Lol. We cannot get grass to grow in much of our backyard. Now it’s wild and littered with stones and I don’t care.